The first week, or receiving week, is mostly administrative in nature. 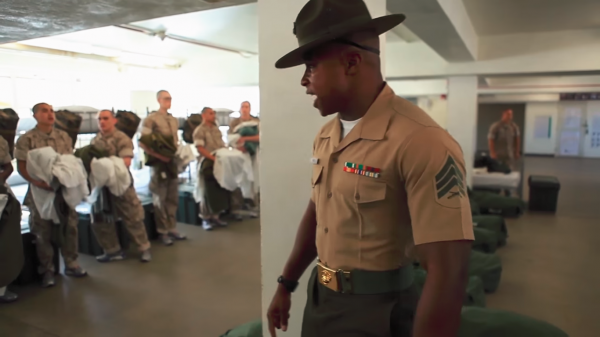 Even though recruits are accompanied by drill instructors everywhere, and even get a sense of accomplishment at the end of it because of the initial shock created by the culture change, it’s not until pickup day that the new recruits get to meet their actual drill instructors, the ones tasked with overseeing and steering the famous transformation. This video shows actual footage of a pick-up day, more notoriously known as “Black Friday,” with these recruits and their drill instructors. This is the first afternoon where recruits spend “quality time” with their drill instructors. Here, Marine Corps drill instructors with L Company, 3rd Recruit Training Battalion, Recruit Training Regiment, can be seeing conducting gear inspections with recruits at the Marine Corps Recruit Depot in San Diego, California. 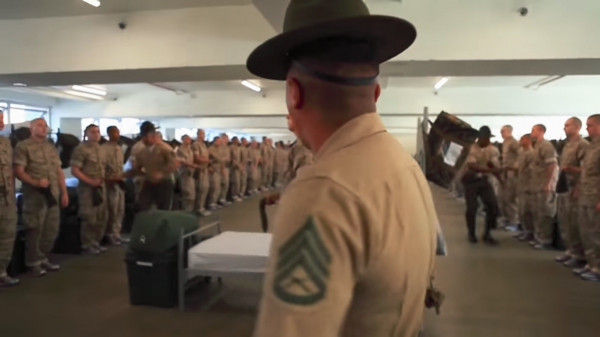 The drill instructors were introduced to their recruits on pick-up day and immediately conducted gear inspections to ensure all recruits were prepared for training. Drill instructor candidates are required to have served a minimum of one full four-year enlistment in the Marine Corps, hold the rank of sergeant or higher, and be able to pass physical fitness examinations and medical examinations. Drill Instructor candidates’ superiors must also recommend them. Marine Corps Drill Instructors are both volunteers and designates that serve a tour of duty that lasts three years. Marines report to either Marine Corps Recruit Depot Parris Island in South Carolina or Marine Corps Recruit Depot San Diego in California, where they are then assigned to Drill Instructor School. Females are required to be trained in Parris Island. For the next 12 weeks, they learn to train recruits in physical fitness, military history, drill marching, swim qualifications and leadership training. After graduating, they are assigned to a Recruit Training Battalion and train a platoon of recruits at 13-week intervals, with 10 days of leave in between each training platoon. Being a Marine Corps Drill Instructor is regarded as one of the most intense positions in the military as they are tasked with turning recruits into Marines and prepare them for potential combat situations.